After I had my epiphany that I no longer wanted to be a neurosurgeon, I didn’t want to major in neuroscience, I didn’t want to live my life based on what others wanted and realized that was what I had been doing (of all places outside our mailbox), I was left with, “Ok…but what do I want to do?” It was an odd feeling to say the least. To be more specific, while unbelievably thrilling and freeing that I was now in charge of my decision, it was also unbelievably terrifying. I was graduating from high school in less than four months and the girl who had everything planned out her whole life had no plan and no idea of where to even start. I imagine this is what many high school kids feel like as they approach graduation, deciding what college to attend and what to do with their lives. I am not going to get in a debate on the merits of how schools have been educating our children. I will say this: Teaching has changed a lot in the last 50 years – some for the good and some for the not so good. I have watched an interesting trend in our schools that, in my opinion, leaves children ill prepared and in a similar predicament to what I experienced, “Ok…now what?” I have noticed, at least where I live, schools tends to focus more on passing tests, getting the right answer and less on finding passion and career paths. However, this can leave kids without direction. 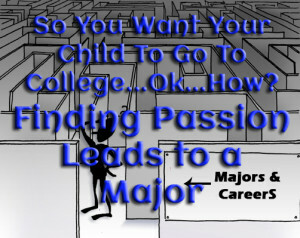 So it falls to us parents to help guide our children in finding their passion and career path. It has been said that if you find a career that you would get up each morning and do for free, then you will never will work. Obviously this does not mean that you will not physically do work. Rather, that when you find something you love doing, it won’t feel like work. Up until recently, your career path was simple. You went to school, you got a good paying steady job that provided for your family. If you were a man, you had many choices and as a woman, not so much. It didn’t matter if you liked what you were doing. You were lucky if you did but reality was you needed a job, a good job – not a career. We should expect that our children will work, and that sometimes that may mean at just a “job”. Everyone has to start at the bottom. However, the hope should be that they will find a career they enjoy and find fulfilling. This involves finding passion. Finding passion is not something we hear a lot in schools, at least that’s my perspective. (On a sad note, I know teachers LOVE kids with passion. Its just does not seem to be the priority for school systems.) 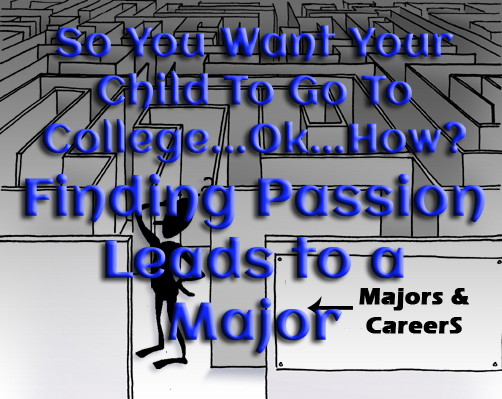 Here is what I suggest for finding your child’s passion, what they can do with it in terms of a career and what degrees they should then focus on. Step One: What Do They Like? The first place to start is always the beginning. The beginning in this case is with your child. Sit down with them and start talking about what they like, really like. Odds are this should not be a surprise. What do they enjoy doing with their spare time? What are their hobbies? What do they talk about the most? Besides the fact that this can help you find their passion, it is a great way to have a cool conversation with teens. For my example here (for ease…a minor cop out I know), say my child loved sports. He knew everything there was to know about almost every major sport. He played sports, particularly basketball. Step Two: What Are They Good At? Equally important is what they are good at. Are they good at sciences? Math? Do they have a great memory? Are they a people person – people are drawn to them? Are they are good writer? Are they good at caring for others? Continuing my example, my child is a great story teller and he writes well. He has an unreal memory for statistics. His science and math are off the chart. He is a great speaker and extremely charismatic. 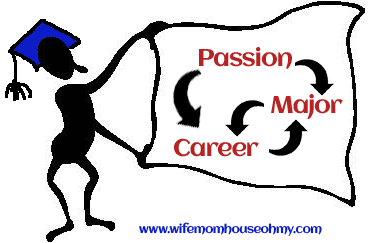 Step Three: What Jobs Use Their Passion and What They Are Good At? Time to brainstorm. Between the two (or three if both parents are involved) create a list of every career/job you can think of related to their passion. Do the same for what they are good at. Hit the internet too. You can start with basic Google search such as for my example “sports jobs”, “writing jobs”, “storyteller jobs”, and so on. A good site to check out is Study.com as they have degree related searches, career related searches, and even what degrees are where. In my example for sports, I also found a site called Workinsports.com where you can search for sports related jobs. Some of the things that would be related to sports: professional basketball player (odds of less than 2%), sports medicine, athletic trainer, coach, announcer, sports reporter, sports analyst, sports equipment manufacturer, sports writer, sporting agent, sports marketing, and so on. Once you have both lists, see what crosses over. In my example, some crosses for sports and storyteller would include – reporter, announcer, writer, and marketing. See what jumps out to your teen as ones that appeal and they would like to look more deeply into. For my example, I’ll continue you with professional basketball player and sports marketing. Your and your teen’s list should be longer. My mother always supported my decisions regarding my education and career. She was always encouraging and interested as I came to her with what I thought I would like to look more into as I decided on a career. However, she was also always realistic with me on the pros, cons and viability of what I was looking at. I will never forget telling her I thought I might like to be an English or History teacher. She was encouraging as she new I loved history, loved writing and literature and that I thrived when I was able to impart my knowledge. However, she also balanced that with sharing her own experiences as a teacher with sometimes limited pay, long hours, bureaucracy that ties a teacher’s hands (which she knew I hated) and challenging children and parents. It gave me a realistic understanding of what I would be going into as a teacher – the pros and cons. Guide your teen to go online and look up details on their potential career – such as job descriptions, what degrees do these jobs ask for, potential salary ranges, employment demand, industry competitiveness, career paths and so on. Salary.com and CareerBuilder.com are great resources. Hit Google and type the career in and see what comes up. There is an association for almost anything and everything these days because networking is key. Have them contact companies HR department on potential internships, what degrees/majors would be good to have for that position. See if there is someone who has the position they could potentially talk to regarding their experience and what degree did they have. This is a who do you know or who do you know who may know someone? You’d be surprised how helpful people are when you ask. This will ultimately help your teen decide if the career/career path is one they want to continue to explore or to say, “No thank you.” to and move on. In my example, professional basketball player may not be realistic if my son is a second string for his high school team. Marketing may be more viable and crosses over in to what he is good at and enjoys. While doing step four, you and your teen should have gotten some ideas on what degrees their potential career options require. Odds are there is more than one for their potential career path. In my example of sports marketing, degrees included communications, business, marketing, public relations and advertising. If one degree covers multiple career path options, then this is probably a safe bet on a major. For example, if my child was interested in sports marketing, sport writer, and sports commentator, then a degree with a major in communications keeps all the options open. They can always specialize or minor in a specific area later. Having a major is the first way to start researching potential colleges and universities. After all there are over 4,000 universities, colleges and community colleges in the United States. You can’t apply for all of them. But that is for another post. Starting with eliminating those that do not have your child’s major is step one. Junior year focuses on many of the critical testing. Senior year is focused on applying to college. Freshman and sophomore years should be used for research. Sophomore is prime for actual college research (covered in an upcoming post). The summer before freshman year through their freshman year summer is a perfect time to start this process. As they continue through high school and gain more knowledge and more experiences, this can narrow or broaden their career path. But at least by starting early, they are not behind the eight ball come junior and senior year for testing and applying. Its a lot to digest, I know. But that is why I’m breaking it down. Well, until next post!